During this time of year a lot of candles are being lit. So what could be of more use than a Fabergé match holder?! This one was made by workmaster Erik Kollin, sometime before 1896! I like the mix of simple and extravagant in this one! The box itself is made of brick. 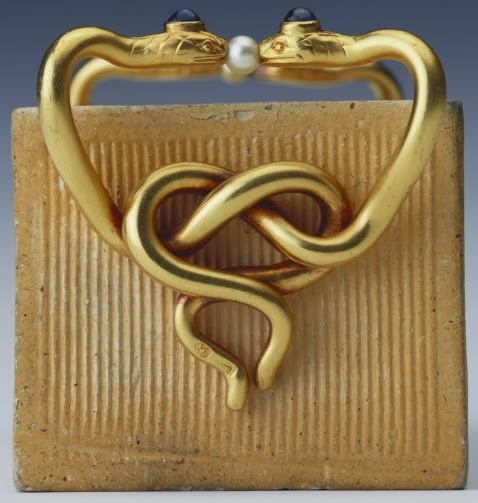 But the ornate handles are of gold, formed as entwined snakes. On the head of each snake sits a cabochon sapphire, and between their noses they hold a pearl. 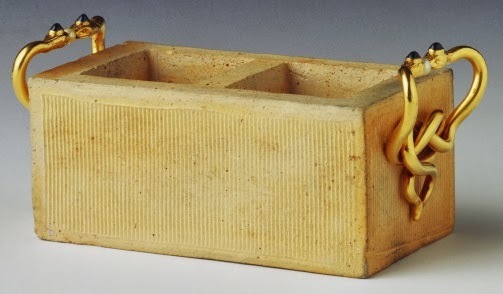 The size of the box is 2.1'' x 4.5'' x 1.9'' (5.3 x 11.5 x 4.9 cm), and it was bought by King Edward VII. Now the match holder is part of the Royal Collection.